Strel Swimming Adventures was founded in 2010 with passion, enthusiasm and love for open water swimming. Our founders Martin and Borut Strel (father and son) have extensive experience in running open water swimming projects. They have organized some of the most challenging swimming expeditions in recent history and received global recognition. Martin, known as the legendary Big River Man, is a Guinness World Record marathon swimmer and only man in the history to have swum the 5 greatest rivers on the planet: the Amazon, Yangtze, Paraná, Mississippi, Danube. Martin is currently preparing his new great expedition for 2017 and we will make sure you are informed when it’s happening. Borut, an experienced swimmer himself, has been working with Martin as a project manager and expedition leader for several years. Together, they have an incredible breadth of knowledge and experience in the open water swimming. In addition, Martin and Borut collaborate with the French company Decathlon (swimming brand Nabaiji) on open water swimming product development some of which you will be using on our swimming adventures. For more information on Nabaiji, visit www.nabaiji.com. We are proud of our strong family tradition in the open water swimming adventure world. We promise to stand behind our name and deliver a great customer service. We look forward to welcoming you on our swimming adventures. Martin is our inspirational visionary. 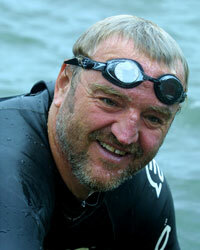 His past marathon swimming challenges are highly respected and well known world-wide. Martin accompanies some of the tours when his schedule permits, to share his experiences and to motivate you to maintain your swimming lifestyle. Martin´s Documentary: Big River Man and Book: The Man Who Swam the Amazon. Borut is an experienced swimmer. As a youngster he was racing internationally and later on he began to work on the project management and guiding of his father´s swimming expeditions. 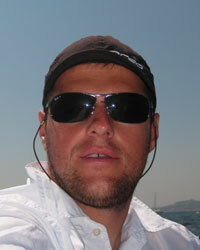 Borut also has significant experience of coaching and guiding swimmers at several locations across the Mediterranean. He is the driving force behind Strel Swimming Adventures and has passed on his vast experience to our guiding team to ensure that our tours are second to none. Nina Strel is our guide on the Lake Powell. She grew up watching her brother Borut and her father Martin organizing swimming expeditions around the world. She has always had a great passion for water and traveling all around the world. She attended business school at the International University of Monaco and completed summer programs at the university of Columbia in New York City. She is living now in Phoenix, Arizona and as a local excels in guiding on the Lake Powell. Along with Martin she leads advanced stroke clinics and improves swimmers´ swimming techniques. G an ASA Level 2 licensed Swimming Coach and experienced open water swimmer. Last year she attended the Swim Smooth Coaches Education Programme at Loughborough University, where she had the chance to coach World Champion Triathlete, Tim Don and Paris-Roubaix winner, Magnus Backstedt. G has also qualified as a National Open Water Coach with NOWCA and has been nominated for the H2Open ´Open Water Swimming Ambassador´! Last year, G swam solos of Lake Windermere, Lake Coniston, Derwent Water and swam in numerous 10k events. She also had great success with her athletes, one of whom came second in Ironman Wales. A successful English Channel swimmer, G has vast experience of coaching triathletes and open water swimmers and is passionate about teaching all levels of swimmers better technique, open water techniques and how to swim faster, more efficiently. 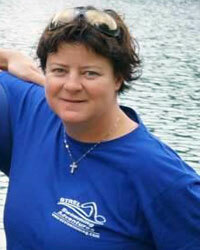 She currently runs a Masters Swim Squad, Cold Water Swimming Team and coaches open water skills clinics. Her website Blue Manta Swimming. Laura swims and plays water polo in England and now she guides for us at several locations including Croatia, Greece, Montenegro and Turkey. 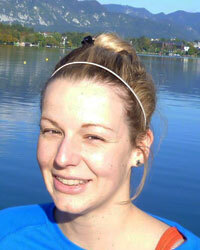 While not in the Mediterranean with us she works as a supply teacher in the UK – mainly in the winter months. Maja loves the outdoors and open water. 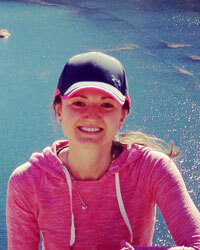 She holds ASA Level 2 certificate in swim coaching and teaching aquatics. She grew up in Kent, England, but having family roots from the Balkans, she now spends most of her time in Croatia. She runs our Croatian trips. During the winter months Maja works as a swimming teacher at the private school Charterhouse, England. 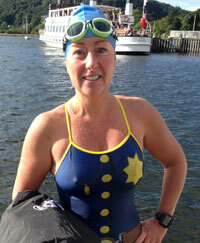 Hazel is an ultra marathon swimmer from Manchester, UK. She loves being in open water and challenging herself. She holds the world record for being the youngest Ice mile swimmer. Also, back in 2014 she did her first solo English channel crossing and became one of youngest ever to do so. Her future plans include: double Windemere lake crossing, around Jersey Island swimming, a 24-non stop marathon swimming, etc. 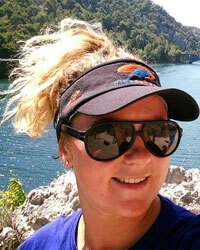 She brings her open water knowledge and experience onto our trips. 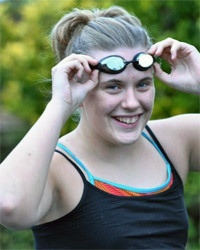 When not guiding with us Hazel works as a swimming coach in Manchester, UK. Angelo grew up on the Krapanj island and is a skilled and experienced boat captain. He takes us out every day to our swimming locations and knows the local waters like the back of his hand. 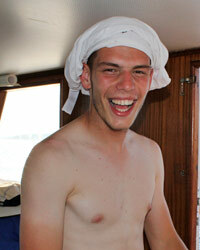 He is a fun loving and entertaining character who looks after us well in our daily expeditions. He has a dog named Diesel. 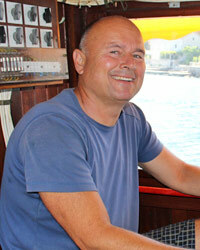 Budo is a proud owner of two beautiful wooden boats and works with us in Montenegro. He is a swimmer himself and works hard to make sure that our guests are all safe and happy. He is the proud father of world class water polo player, Dusan Mandic. If you are lucky he will sometimes show us his son´s Olympic and World Championship medals, won while competing for Serbia. Petra comes from a pool swimming background and nowadays spend lots of time coaching and training younger generations in Slovenia. She runs her own swimming school and works part time as a physical education teacher. In the summer she guides on our Slovenian Lake trips. Rusty is our local guide and boat pilot at Lake Powell. He knows the area better than anyone. 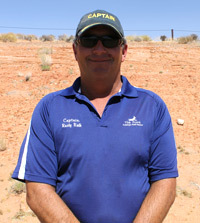 He spends most of his time at the Antelope Point marina and out on the lake guiding different tours. Lake Powell is so big that you need a great guide out there. He will be the one telling you the local history, giving you tips what to see, as well as making sure we swim safe at the best spots. Rusty The Captain! Polona ensures that our office runs effeciently and that your bookings and phone calls are handled professionally. 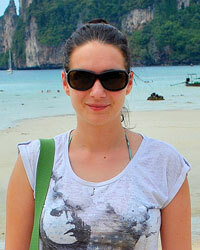 She studied English and French at Ljubljana (Slovenia) University and now works as our customer support person. She speaks fluent English, French, Slovenian, Croatian and other Balkan languages. She loves travelling and exploring new places all over the world. Her favourite places are always near water and with lots of sun! We are happy to have her in our team.